I have had a very busy week at work and while I have been able to do some stitching I’m afraid I can’t reveal anything as the next two projects are for exchanges. I have joined another exchange group in addition to the All Seasons Ornament Exchange which is called the Seasonal Exchange so being the clever people that you are I bet you can guess that the theme of both pieces is Autumn! I am stitching on evenweave which I do find more challenging than Aida due to the smallness of the fabric gauge so I have resorted to both my glasses and my neck hung magnifier to see what I am doing! Have also recently completed another reindeer ornie – only 5 more to go! In lieu of pretty pics of stitching then here are my completed wrist warmers – I had a lot of trouble with these as you may remember trying to match up the variegated wool but made it work on about the 3rd attempt! Please excuse slightly fuzzy pic as the light is not good – it has been raining hard all day and is a bit miserable – was tempted to keep the wristwarmers on as it is a bit cold in the conservatory! 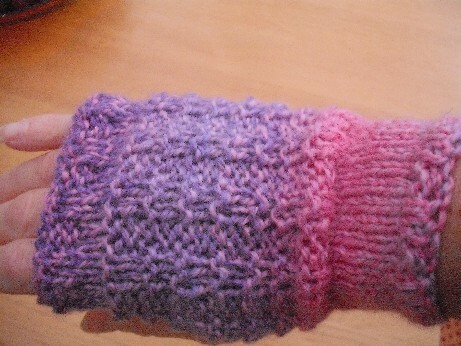 These are from a free pattern called Waffle Stitch Wristwarmers that I got from Ravelry. Term has started so that is why I have been so busy – we have another lovely group of trainee teachers this year and I am really looking forward to working with them all. I am lucky to have a job that I really enjoy and look forward to going into work – though a large Lottery win that would enable me to retire and devote my life to stitching and knitting would be fine as well! I am also going to be busy this week with helping organise the Marsden Jazz Festival – I recently joined the committee for this event which will be held in a village near me on the 2nd weekend of October. See this link for details if you are in the Yorkshire area. As the name suggests there are lots of live music events on in all of the pubs and clubs across the village as well as a parade on the Saturday. This week we have a meeting of all the volunteers who will be helping over the weekend, a t-shirt folding and packing evening and then I will be helping out in the festival shop selling said t-shirts next weekend. Just thought I would leave you with another couple of pics from re-enactment events – courtesy of my friends on Facebook. 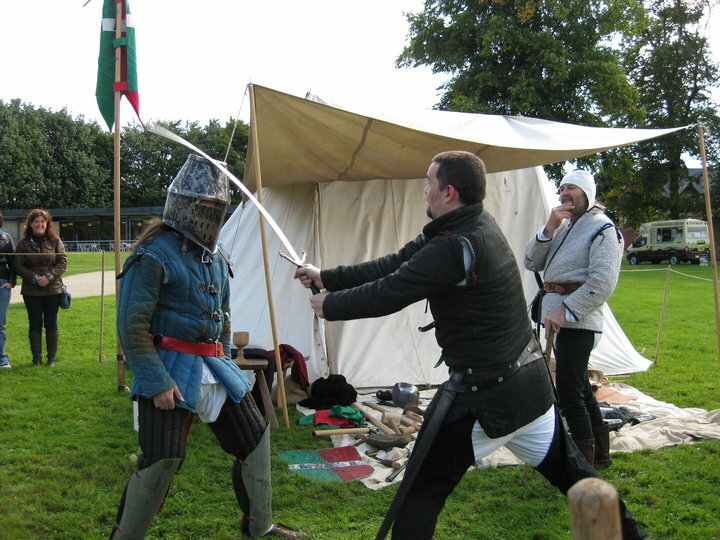 The first pic was taken at our recent August Bank Holiday event at Bolsover Castle and shows Paul (in the helmet) and Luke – with the sword – demonstrating during the weapons’ talk. 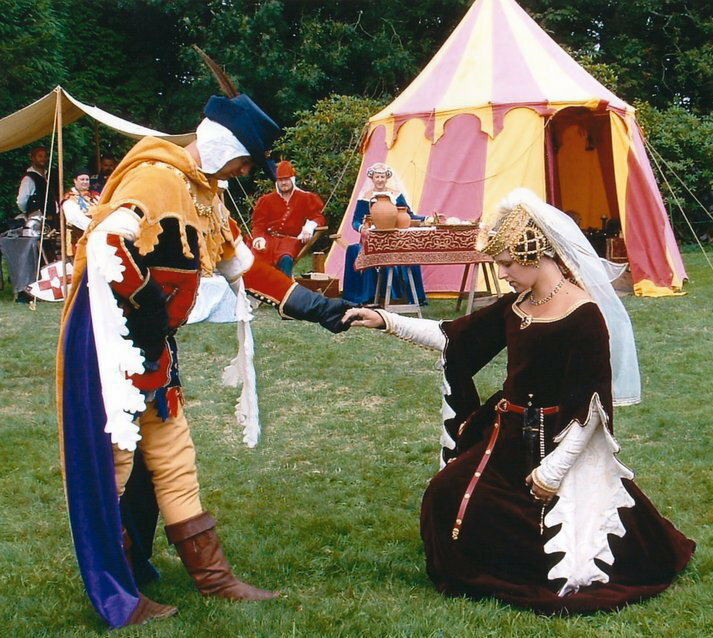 The second one is a much older pic, probably taken about 6 years ago and shows my lovely friends Kat and Richard all dressed up in their costumes – doesn’t he look the epitome of chivalry! If you want to see more of Kat’s wonderful headdresses and costume you can visit her Kats Hat website. I hope that you are having a nice weekend – thanks very much for visiting. I discovered last year that wristwarmers make a huge difference to how long you can stitch for in winter – good to have them finished in time! Yes will have to knit myself a pair as these are lovely but are a present for someone for Xmas. Just so much to do and so little time now that term has started! Thanks for visiting – the pattern comes from the book in the picture – ‘The 30s Family Knitting Book – I have looked on Amazon but can’t find it listed. I think my friend bought it second hand but will ask when I see her in a couple of weeks.